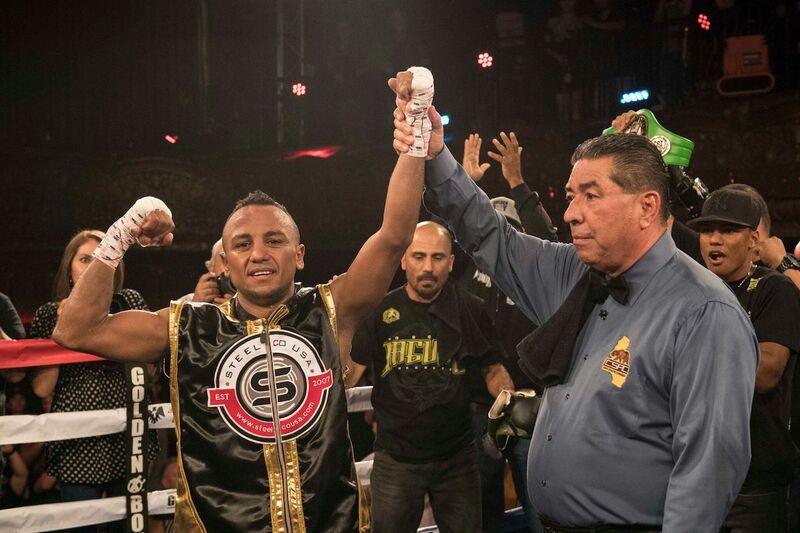 Photo Credit: Albert Baker/Under The Hand Wraps – Oscar “El Jaguar” Negrete (18-1, 7 KOs) once again proved why he deserves another world title shot as he soundly beat Diuhl Olguin (13-10-3, 9 KOs) of Guadalajara, Mexico via unanimous decision in the eight-round main event of the July 6 edition of LA FIGHT CLUB at the Belasco Theater in Los Angeles and televised nationally on EstrellaTV’s Boxeo Estelar. The native of Tierralta, Colombia won with scores of 78-74, 79-73 and 79-73. VIP guests for tonight’s event included Joet Gonzalez, Manny Robles III, Marvin Cabrera, Seniesa “Super Bad” Estrada, Patrick Teixeira, Joselito “El Huracan” Velazquez, and Alberto Machado. In tonight’s co-main event, Rigoberto Hermosillo (12-0-1, 9 KOs) of Guadalajara, Mexico scored a fifth-round body-shot knockout win against Ernesto Guerrero (29-22, 19 KOs) of Sonora, Mexico in a scheduled eight-round super featherweight fight. Hermosillo won at 2:30 of the fifth round. Raul Curiel (4-0, 3 KOs) of Tamaulipas, Mexico defeated Demetrius Wilson (2-8) of Florissant, Miss. via second-round knockout in a scheduled four-round super welterweight fight. Curiel stopped Wilson at 2:13 of the aforementioned round. Blair Cobbs (8-0-1, 5 KOs) of Las Vegas, Nevada scored a four-round unanimous decision victory against Juan Rivera (19-30, 13 KOs) of Aguascalientes, Mexico in a 140-pound fight that started the night of festivities. Cobbs won with scores of 39-37, 39-37 and 40-36. Negrete vs. Olguin was an eight-round bantamweight fight presented by Golden Boy Promotions. The event was sponsored by Tecate “THE OFFICIAL BEER OF BOXING” and Casa Mexico Tequila. The fights took place Friday, July 6, 2018 at the Belasco Theater in Los Angeles, Calif. Mark your calendars and buy your tickets for the upcoming shows on Aug. 10, and Oct. 12.